I love making these cranberries during this time of year. The method for creating these transforms their overall texture into something delicate and soft while preserving their tart and tangy quality. A balanced palette of warm spices is infused into the cranberries to achieve a unique feel and aroma, which is perfect for enjoying during the holidays. Although these are simple and easy to make, they require several hours of soaking and drying to produce—but the end result is definitely worth the wait. Adapted from Cooking Light. Combine the sugar, water and spices in a small saucepan over medium-high heat. Stir until the sugar is totally dissolved. Allow the mixture to come to a full boil, then pour into a separate bowl and immediately add in the fresh cranberries. Cover and place into the refrigerator to soak for about 8 hours. Drain the cranberries. Line a cookie sheet with paper towels and place the cranberries on them to soak up any excess liquid. 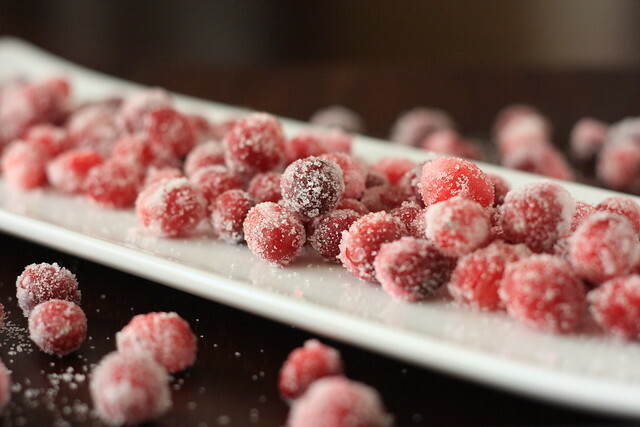 Place the remaining cup of sugar in a large bowl and add in the cranberries. Toss gently until well coated. Reline the cookie sheet with fresh paper towels and place the cranberries back on them to dry for about two hours. They may remain drying on the cookie sheet for up to two days. Perfect holiday snacks!! How long will they keep? They should keep drying on the cookie sheet for up to two days — I updated the posting to reflect that … thanks! Those are beautiful! I wonder what you could do with the leftover spiced syrup…? Thanks Kate. The original recipe, linked above, suggests mixing into a cocktail. It also might taste good drizzled over some oatmeal? maybe? First I have to say WOW it's beautiful! Great for holiday treat. I nominated you for a Versital award. Please take a look at award rules in my Award blog. just found your space..lovely space you hve..
yummy recipe collection with great presentation..
these are drying on my counter right now. i'm looking forward to snacking on them in a few hours! This technique is just what I have been looking for – thanks for sharing! Yummy looking snack! Just a quick clarification question. Does this mean that they only keep for 2 days (or just that you can continue to dry for 2 more days)? I'm wondering if they are sort of dried and can be made in advance for Christmas gifts (or even sent through the mail), or if they're more like fresh and perishable and only keep for a couple of days. Also, do you store them in the fridge or at room temp? Thanks so much for the info and recipe! Thanks Angela! If you are going to jar them and give them as gifts, I would keep them out to dry for up to two days before placing them into other containers. They tend to get soggy if they are not completely dried out. Also, don't refrigerate — they will be fine left out once dried. Do you think it's possible to substitute the sugar these are cooked in with agave, bacon, or stevia to cut down on the glycemic index some? Maybe redundant with sugar coating them but wondered. I think agave would work for the simmering portion. But it takes a lot of sweetness to balance out the tartness of the cranberries, so I suspect you'd need a lot in the simmer liquid. Using sugar to roll them in is pretty essential, and I'm not sure what could replace that. Hi there from the Netherlands! Just wanted to let you know that I've made these last Christmas and all who tasted my cranberries were over the moon about them! Your pictures and styling are gorgeous, IIlona, thank you for sharing! What if you put them in a dehydrator? Good idea or bad? When they are "done" are they still a bit moist inside? Lori, I haven't tried that so I can't say for sure, but I suspect you'd end up with shriveled cranberries "raisins" instead of these plump ones if you use a dehydrator. 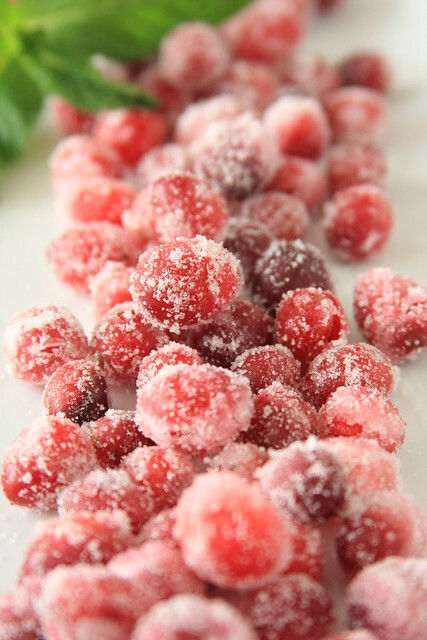 When these cranberries are prepared per the instructions above, they will pop in your mouth and have a great texture inside! You are probably right. These look beautiful!